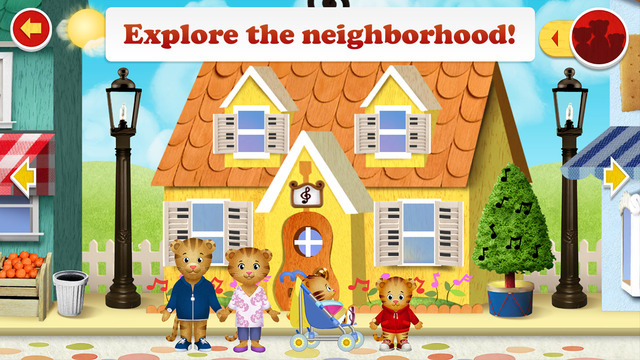 Has your child ever wanted to visit Daniel Tigers Neighborhood? With this new app, the neighborhood is at your fingertips! Explore Daniel Tigers Neighborhood encourages open-ended, imaginative play as children visit familiar places and create stories about their friend Daniel Tiger. Its like playing in a digital dollhouse where you can turn the lights on and off, open and close doors, give Daniel and his family food to eat and much more. Daniel Tigers Neighborhood is a land of make-believe a place to explore and have fun! Grocery Store Stop by the market to pick up all kinds of fruits and vegetables. Fill your cart, check out at the cash register and help the Tiger family bag their groceries. Music Shop Visit Music Man Stans Music Shop to play with lots of different instruments. Theres a stage to put on a show and a potty to remind your child of their important bathroom routines. Bakery In Baker Akers Bakery, youll find delicious breads and treats. 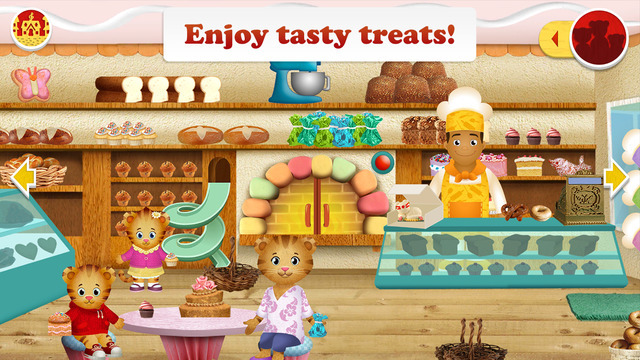 Decorate a cake, collect baked goods in your basket or find out whats baking in the oven. Doctors Office The waiting room has dress-up hats, a fish tank and a trolley game to play. In the exam room, put Daniel on the scale and pretend with Dr. Annas tools. You can be the patient or the doctor! Mini Games In each location, theres a special mini game to enrich the play experience. See if you can find it! Play along with your child and have a beautiful day together in Daniel Tigers Neighborhood! Young children are just beginning to understand and explore the world around them. As they explore Daniels world, they have the freedom to make up their own stories about everyday experiences, situations and feelings. Explore Daniel Tigers Neighborhood is based on the hit PBS KIDS series Daniel Tigers Neighborhood, produced by The Fred Rogers Company. Designed for kids ages 2-5, this app extends the series social-emotional curriculum by encouraging open-ended, pretend play. In the words of Fred Rogers, Play is really the work of childhood. Check out the other Daniel Tiger apps: Daniel Tigers Grr-ific Feelings, Daniel Tigers Day & Night, and Play at Home with Daniel. Explore Daniel Tigers Neighborhood is part of PBS KIDS ongoing commitment to helping kids build the skills they need to succeed in school and in life. PBS KIDS, the number-one educational media brand for kids, offers all children the opportunity to explore new ideas and new worlds through television and digital media, as well as community-based programs. 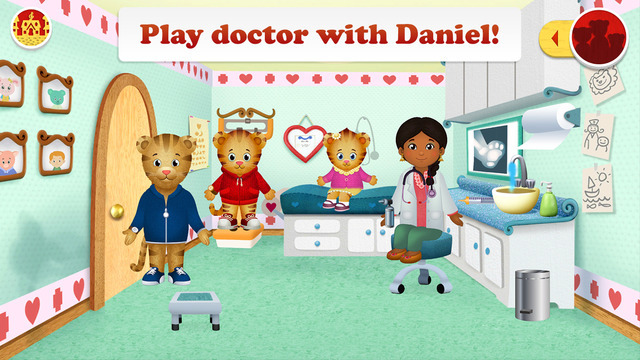 We have all the Daniel Tiger apps and I was pretty excited to see this one come out but it's not very good and not as interactive as the other games. It seems like it was built by a different game studio because there are fewer clues throughout the app of what's interactive and what's not, or what the goal of a particular screen is. I definitely should have read the reviews before purchasing! My 4-year-old daughter is completely disappointed and almost immediately deleted the app because she was bored. There are only a few interactive options, the characters don't really move, and no one talks. Hopefully some of these issues will be addressed in an update but until then, Daniel Tiger's Day & Night is a much better option. This app is pretty fun but there is no house to return to after you shop or do music lessons etc. I would like it more if you could add a house and a school maybe and a shopping mall. This game would be much better if it would have an update with all of these things. And I would also like if after you do something the app could save the things you have done. Requirements: Requires iOS 6.0 or later. Compatible with iPhone, iPad, and iPod touch. This app is optimized for iPhone 5, iPhone 6, and iPhone 6 Plus.